Ecology Action of the Mid-Peninsula is a U.S.–based organization that disseminates a system of organic agriculture called Grow Biointensive. 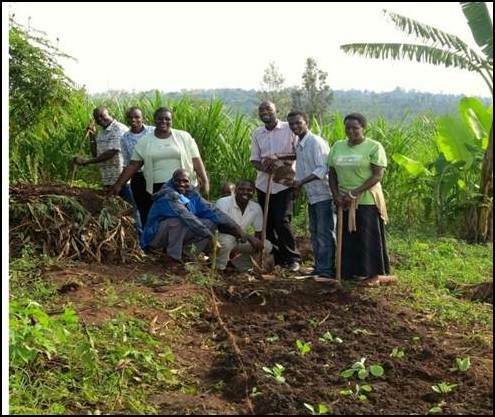 BGR is providing a second grant to Ecology Action for a two-year project that has been training farmers from Rwanda in the Grow Biointensive method. The expected outcome is improvement in the health of malnourished children, increase in the diversity and quantity of household food, and better knowledge of health and care-giving. Farmers should also be able to increase their earnings through sale of surplus produce on the market. In this second year, two master trainers will train a minimum of four Community Resource Persons (CRP) for Rwanda, who will then train individuals and their communities. An estimated 1,500 to 2,000 could receive training directly, and an additional 1,500 to 2,000 trained by CRP and community members. The project includes a third year of support for trainers in Malawi, who hope to spread Grow Biointensive to other parts of the country, with a special focus on widows and their families. Year two of a two-year project. CENWOR (Centre for Women’s Research), founded in 1984, aims to promote gender equality and the empowerment of women in Sri Lanka. One of its major missions has been providing girls from poor families with education and vocational training. For the fourth time, BGR will be sponsoring a year-long project with CENWOR intended to remedy inadequacies in the public education system that result in a high dropout rates for girls. The project will locate ten girls not attending school at any level, determine the reason, and provide them with the support they need to return to school. CENWOR will also locate fifty girls who dropped out of their final years of high school and provide them with vocational training that will enable them to find employment. CENWOR will also offer the women complementary courses in English, basic IT, personality development, and gender issues. Annually renewable project. This is the third of a four-part series on BGR projects approved for fiscal year 2013–14. Thanks are due to Patti Price, chair of the Projects Committee, and Jessie Benjamin, Carla Prater, and Jennifer Russ for preparing the material. The Badlao Foundation aims to empower people for social transformation and help them achieve self-reliance and gender justice. The organization strives to promote an equitable social structure and to enable women and other socially disadvantaged peoples to claim their rights. Last year BGR entered into a three-year partnership with Badlao to improve the economic status of 150 marginalized families in the Deoghar district of Jharkhand state, one of the most impoverished districts in the country. The project aims to improve the economic status and financial independence of women, 88% of whom are moderately to severely malnourished. In Year 2 of the project Badlao staff will continue to teach the selected farmers how to improve their livelihoods by making more effective use of their land. A women farmers’ association (Mahila Sabha) will be established for the distribution of saplings, seeds, and organic manure. Regular meetings for the 150 beneficiary families will cover agricultural training as well as rights and responsibilities, gender issues, and the importance of education and health. 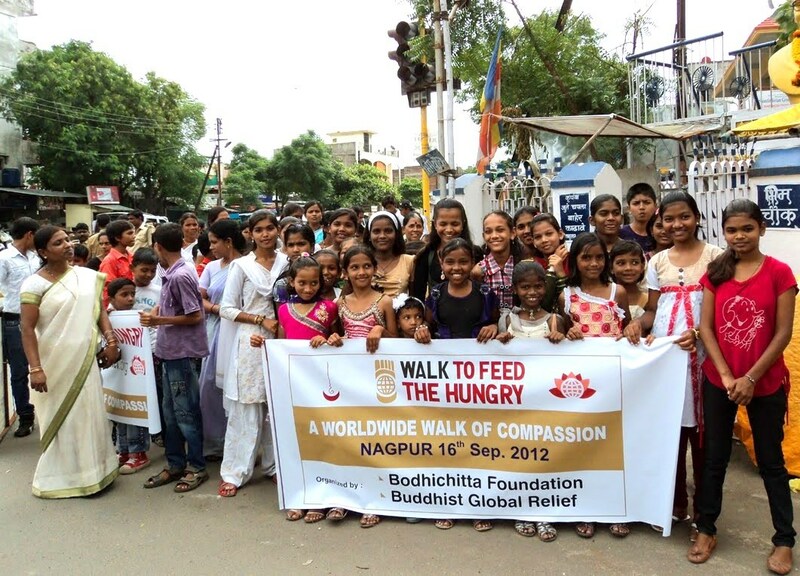 The Bodhicitta Foundation is a socially engaged charity established in 2001 by the Australian Buddhist nun, Sister Yeshe, to help Dalit and slum dwellers in the state of Maharashtra. Last year BGR entered into a two-year project with Bodhicitta to support the establishment of a women’s vocational training and community center in Nagpur, one of the largest cities in the state. This is Year 2 of the project. The center has already started to provide services to women, which include parental training, nutritional support, day care and health camps, computer training, sewing classes, beautician training, literacy classes, and career and financial counseling. The center also offers counseling to women affected by domestic violence, runs a program for malnourished children, and offers basic medical and housing assistance. The projects with the Badlao Foundation and the Bodhicitta Foundation were both made possible by a generous grant to BGR from the India Charitable Foundation, for which we are deeply grateful. This is the second year of a three-year partnership with Oxfam India on a project being implemented in 13 villages in the Tehri Gharwal district of the Uttarakhand region. The project is designed to benefit over 6500 people in 1200 households of small and marginal farmers. Its focus is on enhancing food security for women farmers by building a sustainable production system that can prove resilient in the face of a changing climate. The project will: (1) strengthen integrated farming systems; (2) increase the use of the System of Rice Intensification (SRI); and (3) teach non-pesticidal sustainable agriculture. Ecology Action of the Mid-Peninsula is a U.S.–based organization that disseminates a system of organic agriculture called GROW BIOINTENSIVE. Ecology Action has taught this system to small-scale farmers in Mexico, Russia, Kenya, Uzbekistan, and Afghanistan. BGR is sponsoring a two-year project with Ecology Action that will impart training in Grow Biointensive to farmers from Rwanda. In the first year, four community leaders from Rwanda will be sent to Kenya to learn the Grow Biotensive system. On their return they will train 3,600 Rwandan farmers in the techniques: 1,200 in year 1 and 2,400 in year 2. The project includes continuing support for trainers in Malawi, who are ready to start their second year. The expected outcome is improvement in the health of malnourished children, increase in the diversity and quantity of household food, and better knowledge of health and care-giving. Farmers should also be able to increase their earnings through sale of surplus produce on the market. CENWOR (Centre for Women’s Research), founded in 1984, aims to promote gender equality and the empowerment of women in Sri Lanka. One of its major missions has been providing girls from poor families with education and vocational training. For the third time, BGR will be sponsoring a year-long project with CENWOR intended to remedy inadequacies in the public education system that result in a high dropout rates for girls. The project will enroll sixty young women, ages 17–25, for six months in courses run by the State Vocational Training Authority. After finishing their training they will receive six months of placement assistance. CENWOR will also offer the women complementary courses in English, basic IT, personality development, and gender issues. In Vietnam, the price of hospital stay does not include food. Already challenged by the hospital expenses, most patients and their families are hard pressed to buy food. With a grant from BGR, the Tam Binh chapter of the Red Cross of Vietnam, in collaboration with the local government, has stepped forward to feed poor patients in need. The BGR grant suffices to provide two meals a day to patients throughout the year. This is one of BGR’s initial projects, which has been renewed annually for the past four years. For the past four years, BGR has been sponsoring scholarships to students in elementary and middle schools in both the Cam Duong and the Tam Binh areas of Vietnam. The scholarships are given by the Red Cross of Vietnam to 150 students in each of the two school districts. These are children from the poorest families who achieve good grades and display good conduct. Without this aid, these students would not have the means to continue studies at the primary and middle school levels. The scholarship provides each student with an enrollment kit that includes the annual enrollment fee, educational materials, and basic health care during the school year. This project, renewed for the third time, is conducted in partnership with the International Cooperation Center of Thai Nguyen University. The program expands training in the System of Rice Intensification (SRI) to village farmers in three villages of Vo Nhai district, Thai Nguyen province. SRI results in increased yields with smaller inputs of water and fertilizer.